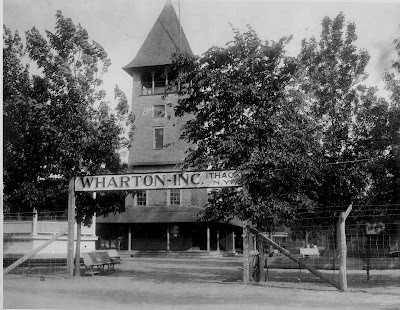 The Wharton Brothers studio in Ithaca, New York. One of the many studios that Babe Hardy would work for during the early part of his film career. 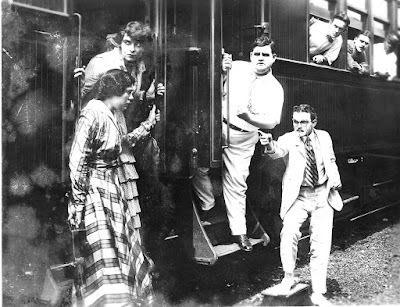 Mid 1915 after leaving Lubin, Babe Hardy traveled up from Jacksonville to New York City and made some films for Edison as well as some other small companies. At some point he ended up in Ithaca, New York working on The New Adventures of J. Rufus Wallingford, a serial produced by the Wharton Brothers (the same folks that made The Perils of Pauline). Two of the photos posted here show Babe in one of those episodes, although one of the photos does not show his better side. I obtained these stills via E-Bay. 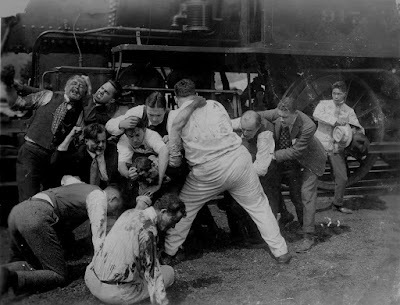 I was surfing around and found a batch of stills up for bid and I thought I saw a shot of Babe in the pile. I was certain that some of the stills were from the Wallingford serial, so I bought them. There were about twenty in all. I checked them when they arrived and eureka!, it was Babe in a few of the photos. Some were water damaged but the image what what matters the most to me, so a bit of damage was okay as long as the majority of the scene was not obscured. I noticed that the seller lived nearby so I e-mailed and asked if there were any other stills from the same lot. There were, about 100, and he consented in sell them all to me!! I went to pick them up and he took $75 for the lot. Boy was I happy. Anyhow, bit of a long and boring story but I did want to explain why there is some visable damage to the photos. Other photos in the bunch show Pearl White, Creighton Hale and a very young Lionel Barrymore. I 'llpost those on my other blog once I get them scanned.